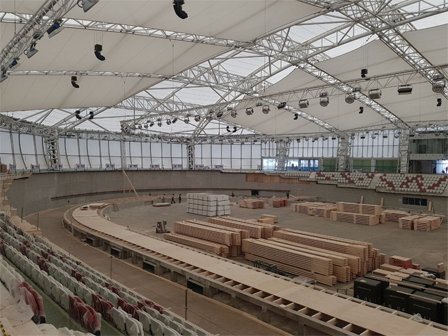 " It's currently installing a bike track using Siberian wood imported directly from Siberia through Germany"
The bike track of Jakarta International Velodrome, Rawamangun, East Jakarta uses special wood materials from Siberia. The bike track itself has 250 meters length. PT Jakpro Jakarta's Jakarta International Velodrome Project Director, Iwan Takwin said, velodrome development has reached 90 percent. "It's currently installing a bike track using Siberian wood imported directly from Siberia through Germany. Use of materials is based on recommendations from the World Bicycle Federation," he expressed, Monday (3/25). He explains the Siberian wood is different from wood in general. It has a smooth texture and strong thus it must be maintained well. It is because it has a characteristic of four seasons. "To maintain its durability, we adjust the temperature and decrease moisture content up to 70 percent," he expressed. He added, the tool used to set the temperature is known as humidity system. Its use, it simply attached to the air conditioner (AC). "By so, the wood can last long," he stated.